Be there. see it happen! 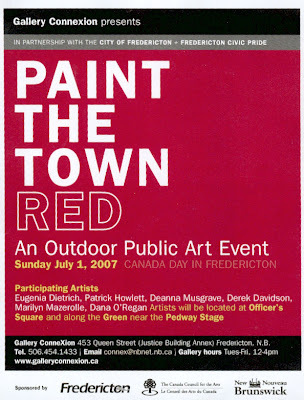 A project of Gallery Connexion, Fredericton, NB. You have 70 friends with recently updated profiles [28 June 2007]. Mireille is the first one over the fence and into the new pool. Dwayne is trying to keep his head above water. Kateri is going insane lisitening to the construction in front of the house . . .
Jon is pretty sure The End is the soundtrack to Hell. Sabrina is really glad we are done with N.E.S. Sharon is is having a banner day. Tamara is really not looking forward to having to robe for law talking in this heat. Eric is thinking about his next work. Emiko is finding the life of a rap artist a difficult one to lead. George is way behind in everything. Stuart is a book who is meeting Degen & Chambers for lunchville. Steve is afraid of Etobicoke. Corey is counting sleeps till he goes home to NB for a visit - 15. Greg is shocked about the Chris Benoit incident! Ran is thinking of new ways to promote his '350 Rans' photo performance. Michael is sharing chapter 2 with you now. Darren is now the western in "spaghetti western." Melissa is standing beneath an orange sky. Caine is all about cheering a capital night with N. Zealand Bro an Sis in Suwon! Cheers! Lee is even more stuffed up, and his head hurts, and so he sighs. Todd is recording more poets in Soho today. Carleton is reminded of the consummate Vs Strongbad demanded of himself whilst creating Trogdor the Burninator. No, seriously. Jennifer is studying Mae West. Jessi is in love . . . life, beer, travel, and adventure. Alan is now eating a big thick creamy bowl . . . of cereal. John is having a week where everyday feels like a monday, but he's looking forward to rockin out to Nickleback and Buck Cherry with his son Christian!!! Dennis is all knowing concerning roma werewolves and reading palms. Jacqueline is is hot and sweaty and going swimming! Evan is happy his Rose is still there. Amber is leaving in the morning. Nancy is just planting a rose called "intrigue". Emily is annoyed to discover that Books and iRead are different aps, and that she still can't see what half her friends are reading. 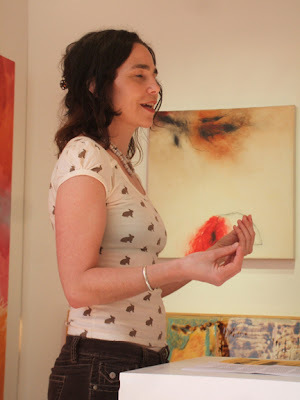 Shauna is going to the opening for Kip Jones' installation Walkman at Struts. Shantell is made of cheese. Catherine is as mercurial as the edmonton seasons. John is is well fed on great food and didn't have to do any cooking. Patricia is looking for a beautiful mind . 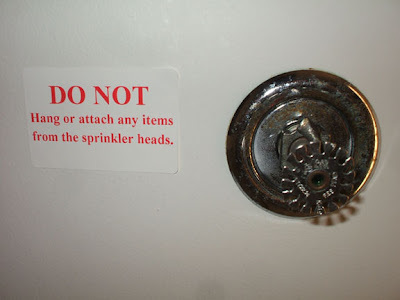 . . Haven't found one yet. Perfection is an elusive quality. Michel is getting ready to play music all day . . . wow what a show in the air last night . . . electrifying. Silas is finished posting his Newfoundland photo album. Moe is ready to roam on red soil. Penn is anxious that you NOT come to her OCAD reading on Thurs. as it has been postponed! Corey is in Brooklyn for a week, and will be back in Canada on Canada Day. Shannon is excited that she got her passport! Ashok is looking 2 a fast and furious immediate future. Milan is excited Piper Perabo will play @ his party on Friday! And that Bill Hachey is coming. :]. Johannes is a Leftenant Zombie. Carson is leaving for a three year stint in Peru this August, and very excited indeed!! Jeannine is giving the appearance of working in a gvt office, but is really out driving her JETTA! Ralph is stoked! BBC Liverpool is running a Bongo Beat radio special on june 30th! Cheryl is finally back in vancouver! Diane is looking forward to a day of wandering and writing. Peter is still getting ready for the next camping event. Debra is enjoying making a map of where she's been. Lee is out of halifax into florenceville. Brenda is Holy Lighning Batman!! No sleep last night! 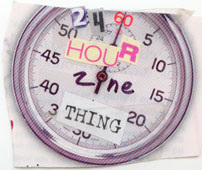 The webpage for the 2007 24-hour zine thing is up and running at The 24-hour zine thing!. They're ready for your sign up if you're interested in attempting the challenge this year. And what a challenge! To make a 24-page zine in 24-hours from start to finish! You can sign up at any time, but remember that you need to complete your zine during the month of July. And whether you complete your zine or not, you'll still get a button just for trying. For those that finish their zines, the organizer will send out a copy of their 24-hour zine . . . or if that should fail *gasp* participants will get a few issues of the perzine. Either way, everyone is a winner! There's also a button design contest. They're still accepting design submissions until July 15. We've got a few so far, and they'll be put up on the web page in the near future. Buttons will be 1 inch round, and the design is up to you! You might not be rich and famous, but your button will travel and be adored by affectionate zinesters. sound: Bob Marley & The Wailers "Jamming"
Show started with a feature on poet Tchitala Kamba and her book+CD L'exilée de Makelele (St Boniface: Éditions de Plaines). Two by R.C. Weslowski followed: "ww3: war on the worms" & "memo from the gods". Sheri-D Wilson with "Famous Five". 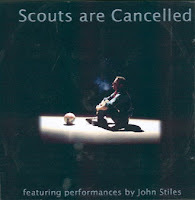 Second half of the show featured John Stiles and Scouts are Cancelled. Was just enough time at the show end for "It takes time to understand the stone" by Drek Daa. sound: The U.S. Bombs "Explosion"
sound: The Jimi Hendrix Experience Are You Experienced? 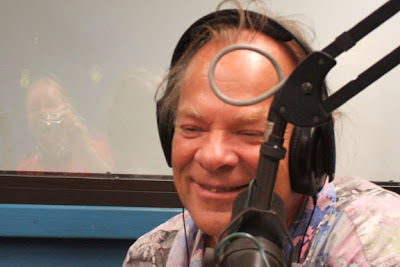 Friday Morning After, with host Jeffrey Mackie, interviews Fredericton, NB, poet-publisher Joe Blades about writing & publshing and last weekend's ottawa small press book fair. 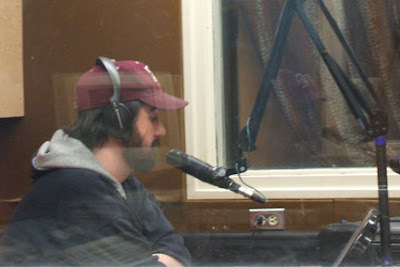 on CKUT 90.3 FM / Radio McGill, Montreal, QC. The show went pretty much as planned, with a twist. Biff (aka biffmitchell.com) joined me in the studio, with Eric Hill in the Fishbowl, and Andrew "Old Skull" Titus called in from his cellphone: three members of the recently formed BlackTop Motorcycle Gang writers' group here in Fredericton. They were circling the mics, talking the talk, and reading poems for that nebulous listening audience. 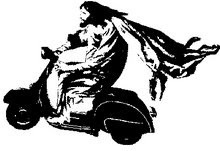  George Carlin "Occupation: Foole"
 Tom Konyves & Ken Norris "Were Men, It Is"
An unexpected surprise was me being invited, live on air, to join the BlackTop Motorcycle Gang writers' group, to become an eighth of a piece. Afterwards, Biff and me went to Alden Nowlan House for a pint; stumbled into Mary Ann's 50th b'day party, 2-for-1 happy hour prices; and an invasion of Frisbee [do they still call it Ultimate Frisbee?] team players to the point that skateboards were hanging in the great eastern white pine tree off the deck . . . The show should be rebroadcast Saturday morning, 10-11 am. That's the time slot Scott named this afternoon, when he asked if I could resume recording program episodes to the DigiCart. 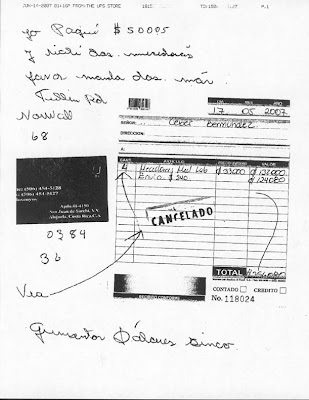 again, one of the needful or needy or something in uscna have confused themselves on either where they live or how one in north america ulilizes telecomunications to reach los cuyos or anyone in costa rica. it could be geographic ignorance (but the neighbours don't like being called ignorant let alone seeing the proof, the evidence.) one thing i do know is that costa rica is a long way from fredericton in the wild western maritimes of atlantic canada . 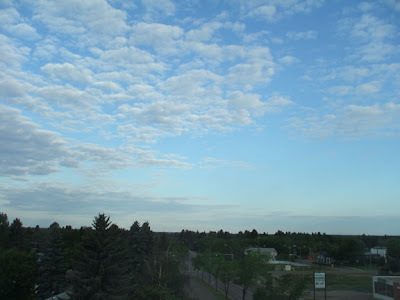 . .
back from edmonton in the wee hours of today . . . i wanted a simple-to-manage show. Started with the 40-minute 9th Christina Sabat Memorial Lecture, "Creative Transformation: Where Life, Art, and Reality Collide" by Peter Powning of Markhamville, NB. The other two pieces to complete the hour were "Big Sky Alberta" by Sheri-D Wilson and "Butterfly Bomb" by R.C. Weslowski. morning finally started with a mic-free open mic. eric folsom against the wall during reading of a poem from his laptop. 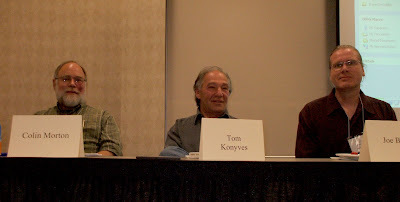 kathy mac, gary hyland and others in the audience. brian campbell blocking the doors. three poets made visible, while being introduced by jannie edwards, our moderator. session was well attended, of interest and got reaction from the poets attending. good! in the evening, in the underground kasbar lounge, for the joe sherman memorial reading: the new [league] members' reading . 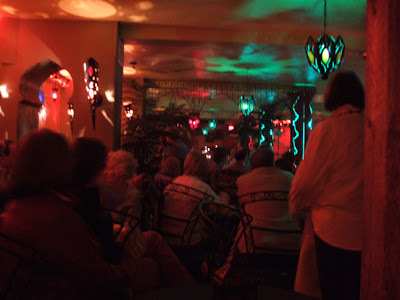 . . poets almost invisible, no light on their poems as they read, but they pressed on . 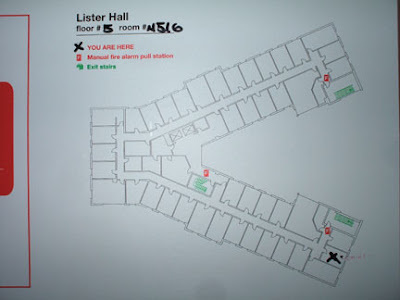 . .
it was about 12:20 am (3:30 am fred time) that i got through check-in and into my room in schaffer hall. air can was late leaving toronto because of refueling but arrived onlt 3 minuted behind schedule. poet mick burrs was on same plane and he suggested that i might get a drive into ed with his ride with the incoming pres, maurice mierau (from winnipeg), and his father. it worked. was driven to the door of lister con centre. thanks! 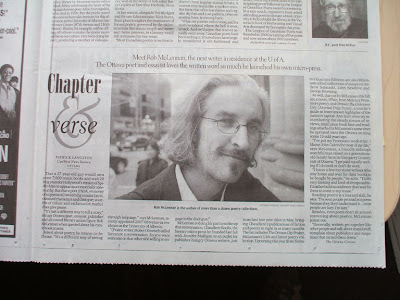 article on rob mclennan, incoming writer-in-res @ u of alberta on the bottom of the same book page in today's journal. 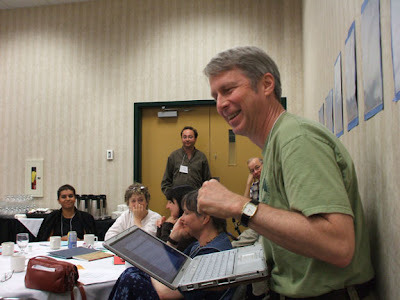 big thanks to richard helm, journal books editor! Just got off the phone with Richard Helm, books editor at the Edmonton Journal. 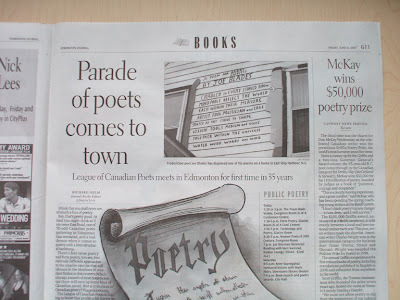 He was asking a few questions about the League of Canadian Poets' Poetry Fest and AGM weekend in Edmonton for an article to appear in the Friday, 8 June 2007, issue. Questions about what I'll be doing on the Poem Made Visible panel, and whether I'll be advocating or encouraging outside-the-book [box] thinking and activities as exemplified by my "Poem for Barry Colpitts" painted on Barry's house in East Ship Harbour, Nova Scotia. 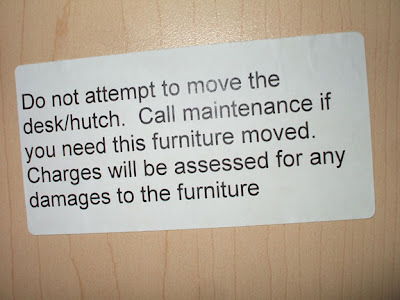 My photo postcard of that painted poem might illustrate the article, (and that would be neat to see happen). I'll have to get the Friday paper and see what sort of article/coverage is there. Fredericton "Words of the World"
I'd like to thank everyone who joined me at the reading plinth for Fredericton "Palabra del Mundo / Words of the World" Simultaneous Poetry Reading on 28 May 2007Biff Mitchell, Ashley Sanford (her first public reading), Edward Gates (from Belleisle Creek), Kimberley Gautreau (from Moncton), José Luis Hoyos, & WhiteFeather Christie Hunterand all who came to listen, to hear us. I've added an album of photos that I took there (with none of me, but Biff or Dorina likely has pics of me). 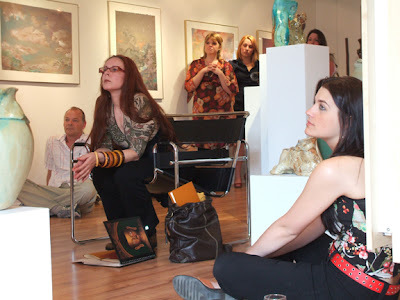 A gallery shot showing several of the readers and audience: Biff on the floor, Kimberly in the chair, Ashley along the wall. 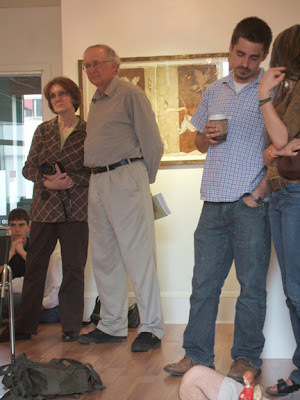 Artist Dorina Gates and poet Edward Gates; artist Adam Macdonald to their left. 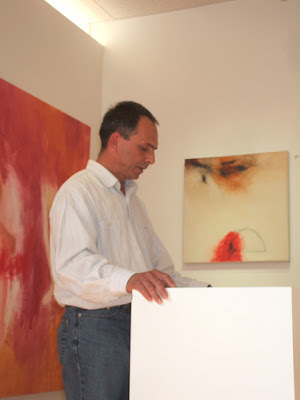 José Luis Hoyos who gave an impromptu translation into English then read his poem in its original Spanish. 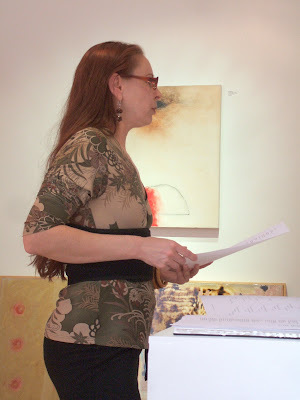 Kimberley Gautreau reading for the first time in Fredericton. WhiteFeather holding and breathing fire. "As I Stand" by Fortner Anderson + Alexander MacSween. "The Only Two Smokers" by Ivan E Coyote. "Hard To Choke Your Artichoke Heart" by Nico Rogers. "I Sold My Wealth" by Odessa Thornhill. Interview with UNB students, writers, and Qwerty editorial board members Jesse Ferguson and Danny Jacobs. "ww3: war on the worms" by R.W. Weslowski. 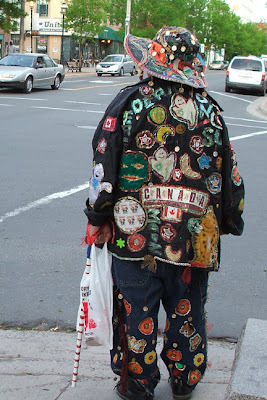 A month early for the Canada Day weekend,, and not an extra for Sticks and Stones, I just happened to catch this woman as I was turning the corner on a run to Victory Meat on Thursday. Early Friday, 6:30 am, I was on the corner of Queen and York as a flag waving, hockey stick banging extra for Sticks and Stones. Then we shuffled over to the Lady Beaverbook Arena, to the extras' big white tent. No sooner had I filled out the extras photo release form for the low day rate than they asked for adults without kids present to become media (journalists and photographers) and I became one of them. No question. We were hived off, herded to Costume for their onceover (I was dressed just fine) and put in an arena dressing room to complete a new release/pay form at a higher rate. Nice! 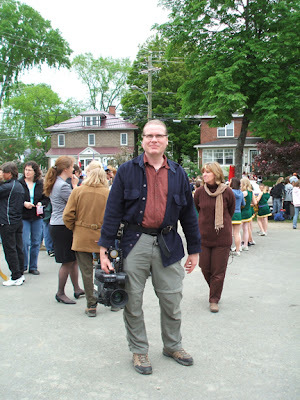 Eventually, we were taken outside to props to be equipted with 35mm SLR camera with flashes, camera bags for a few of us. This is my pic of several of the others, including Carlos with the great scarf. They wanted one of us become a camera operater with a real Sony Betamax camera with the heavy belt and a mini-spot mounted on top, and they chose me. 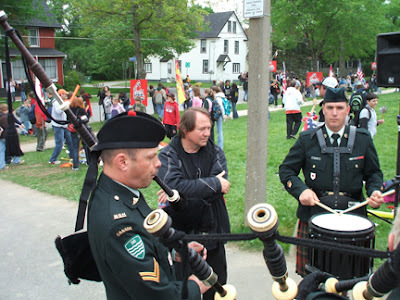 The director, George Mihalka, listening and making music selections while the pipes & drums played. Me with my heavy prop Betamax. Phonto taken with my camera by Lizette De Klerk (a.k.a. of "a Brockon family"). Being a "media" backgrounder, I was front and centre for the podium speech hockey team welcome outside, then on the ice in a media ring outside the hockey players and the red carpet. 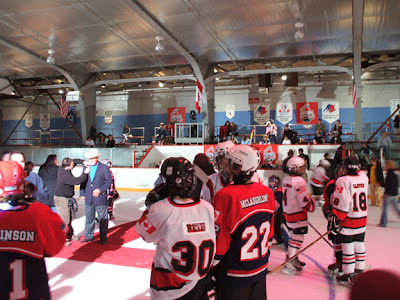 for the announcing of the players, the ceremonial dropping of the puck by "Frank Mahovalich", the real Eddie Shack (above, in the cowboy hat), and the bringing in of the Stanley Cup and the players hands-on acting with it.